This is Margaret's primary field of research, as she tries to craft the correct clothing for her chosen persona: a noble woman in the court of Elizabeth of York, Henry VII's queen and the mother of Henry VIII. When Margaret began looking for resources to help her craft clothing for her husband, Lord Giovan Donado, she found little published about men in the time period around 1500, especially if she focused on his persona's birthplace, Venice. Margaret and Giovan have three children: William, Edward, and Henry. 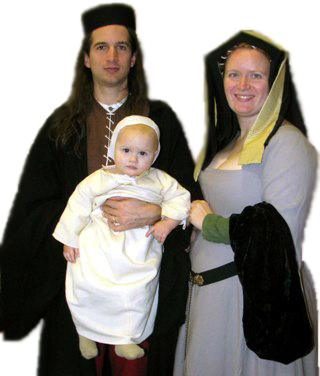 In an effort to introduce them to the diversity of cultures represented by participants in the Society for Creative Anachronism, Margaret has created clothing from a wide range of cultures and time periods, including tenth century Norse, Greenland in late 14th century, English in 1500, and 16th century Turkish. To better engage her children in the SCA, Margaret encourages them to enter Arts and Sciences competitions. These are projects and skills that her children have successfully completed and enjoyed. Margaret has also been known to scribble down a poem or two, and compose new lyrics to old songs. Some of her works are collected here.